We need to collect data to detect these changes and examine how and when this is happening. This data can be viewed, live, as it is streamed from field sites. summer will have an increased number and frequency of days with high temperatures. The data is used in the decision making process when planning site visits and maintenance schedules. It will inform outdoor enthusiasts of local conditions, and indicate when river levels become significantly high or low. 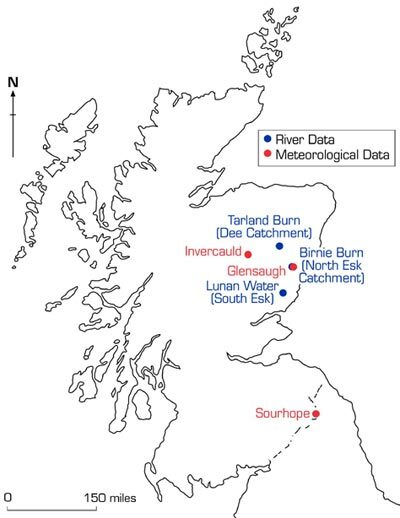 During 2012 work on the impacts of volcanic ash originating from the April 2010 eruption in Eyjafjallajökull, Iceland on the natural resources of Scotland used both Glensaugh and Sourhope for comparing pre and post eruption stream data. Read the report .